Pinal County Arizona has officially thrown out its speed cameras. Newly elected Pinal County Sheriff Paul Babeu, whose platform included a pledge to eliminate photo radar, followed through with his campaign promise and canceled the county’s contract with Redflex Inc, and the county board of supervisors voted 3-0 of support the decision and cancel the contract . "I'm against photo speed enforcement completely," Babeu said, "Here in Pinal, it's failed miserably." Arizona has the most extensive photo radar deployment in the US , but a growing tide of public resentment against the cameras has resulted. The group CameraFRAUD.com has led the charge against the speed cameras and has been collecting signatures for an initiative that would give Arizona voters a chance to ban all forms of photo enforcement on both the state and local level. Meanwhile, Maryland is on red alert, with the 2009 General Assembly now in session. This is the month window of time when state legislators are able to pass new laws to limit personal freedom and increase the power of government. Legislators from PG County and Howard County have introduced legislation to extend cameras to those counties. And Governor O’Malley has pledged to reintroduce the legislation which nearly passed in 2008 which would have allowed speed cameras on almost every road in the state. And Montgomery County is attempting to introduce legislation which would allow photo enforcement of railroad crossings (which can cause confusion for motorists since they do not have "amber lights" and the amount of time they have to react before the camera fires is unknown), and another which would give each local city and town the ability to have speed cameras without oversight by the county. Now would be a very good time to take action to let state and local officials know you do not want this expansion of surveillance against ordinary drivers. Montgomery County is proceeding to rapidly install new cameras, including some which were obvious traps. 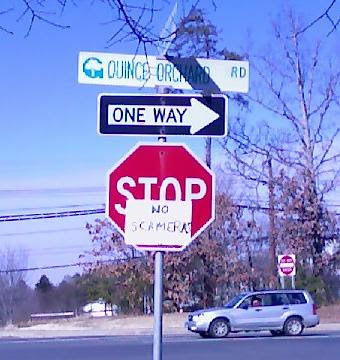 As a result, acts of quiet protest and civil disobedience like the one in this photo have become commonplace (this one was spotted by a reader near a new speed camera location being added on Quince Orchard just east of the intersection with rt 28, scheduled to go online around 1/29). To help give speed camera opponents a voice, CameraFRAUD is setting up a branch in the DC metro area. However, they can only light a candle in the room, and they need your help to stop big brother! The next Montgomery County town hall meeting is scheduled for January 28th at 7:30 at Kingsview Middle School, which is one opportunity for Montgomery County residents to express their views to the county council on the subject. You can also write or email them.